I know that when I am not blogging it must seem to my readers that I am not writing but indeed I am! 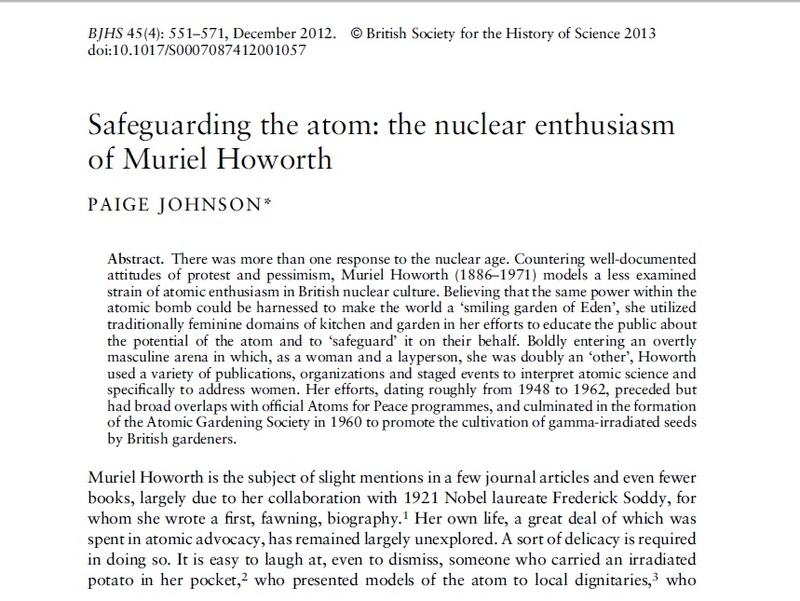 My paper on Muriel Howorth, founder of the Atomic Gardening Society has just been published in the British Journal of the History of Science. Cambridge University Press has the enlightened policy of allowing the author to post the article on their personal website as soon as it appears in print (take that, Taylor and Francis) and so I am posting it here, for those of you that are interested enough in the topic to brave a scholarly article. (Really, it's not too bad. I am invariably told by journal editors that my style is too narrative anyway). The information on the AGS is mostly in the last section of the paper. Above is my favorite picture of Muriel, from the Wilkinson collection, which is the family archive of her remaining papers. Who gives their mayor atomic models?? Muriel does. In furs and an amazing hat. You can download the paper as a pdf here: Safeguarding the Atom. Although completely at odds with my own personal vision of gardening, Muriel certainly stood by her convictions I will give her that! ;). Congrats on another publication. Thanks for posting it - I look forward to reading it! Great news and thanks for sharing. I knew nothing about Muriel, and certainly nothing about her nuclear enthusiasm, safeguarding the atom. The photo of the Mayor of Eastbourne..he looks like he doesn't want to touch that! !